Manicures, Pedicures and Brows! Our trained and talented Nailistas are dedicated to bringing you high quality treatments using the best products, to give you a luxurious, relaxed and stress-free pamper. We're delighted to bring something a little different from what other nail bars have to offer; a fully professional service with qualified and experienced, friendly nail technicians who are passionate about sending you away with a smile. 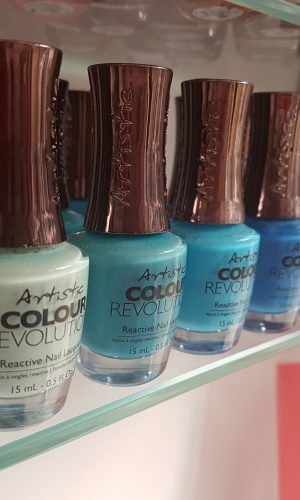 We offer a fantastic selection of carefully curated treatments ranging from a simple file and polish, gel manicures, luxury pedicures, acrylic and gel nail extensions and brow waxing and tinting. 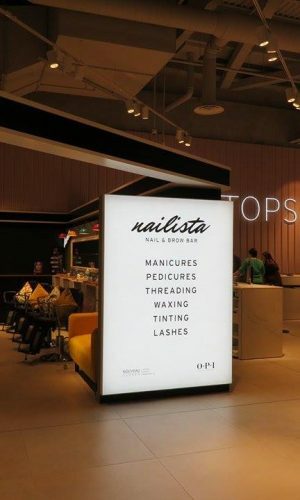 Based in Chester, Manchester and the Trafford Centre, and open 7 days a week, it's so convinient to pop into your local Nailista whenever you need a little relaxation, booking is so simple too! Just call the salon, book online or download our easy to use app to track your appointments. Just book in, sit back and nailax. … are all professionally trained, manicure, pedicure, brow and lash experts. They’re Nailistas because they love what they do. And their knowledge, skill, training and technique means they really know what they’re doing. We’re meticulous about the quality of our treatments, and like to ensure that every manicure that leaves our salon meets our high personal quality standards – and yours too. You can trust Nailista to look after you whether you’re popping in for a treat or coming back every week to maintain your look! … are all of the highest professional standard. Whether we’re creating glamorous classics or the hottest new looks we only use world-renowned brands such as OPI, CND Shellac and Artistic. Our salons may feel relaxed but we always take our treatments seriously! That’s why all our equipment is fully sterilised, our Nailistas are fully trained and our colour choices are fully stocked. We don’t use E-files so we can deliver an exacting and safe manicure. Whatever requirements you have for your treatment, why not give us a call and see if we can accommodate? We’re always happy to try our best to give you the Nailista manicure of your dreams. So you can trust your talented technician to deliver polished perfection. Every time. In short… at nailista, you’re in safe hands. Located on Bridge Street in the heart of the city centre, Nailista Chester is convenient for all of your manicure, pedicure and brow needs. We recommend booking in advance for this salon, which will happily accommodate individual and group bookings. With a huge range of colours in normal polish, as well as Shellac and Artistic gels, why not stop in during a day out in this picturesque city? 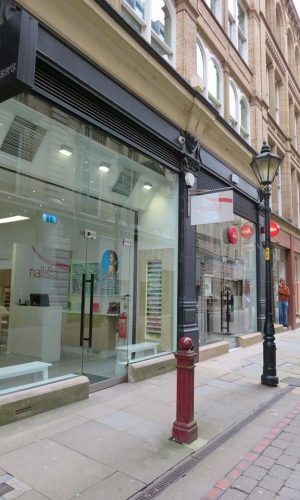 Ideal for city centre shoppers and business workers looking for a quick lunchtime manicure, our Manchester salon is located on Police Street. There’s plenty of room at this salon for parties, with multiple pedicure stations and two floors of manicure stations. A bright and airy modern salon like all of our branches, you can be sure of high quality products and highly trained staff. Situated on the top floor of the northern flagship Topshop store in the INTU Trafford centre, this super chic concession is the ideal add on to a perfect day out. Stop in for an express gel manicure in between perusing the latest fashion at Topshop, or get those brows ready for a glam night out, before shopping for your outfit. Our Trafford centre branch has plenty of technicians and stations ready for walk-ins.